A day at Avalon Villas drifts by oh so easily. Start with breakfast under the tropical sun, served whenever you like; kids splish-splashing in the pool; enjoy a massage in the garden; take a walk to the beach at sunset; return for a gourmet dinner prepared by your chef, then go dancing. 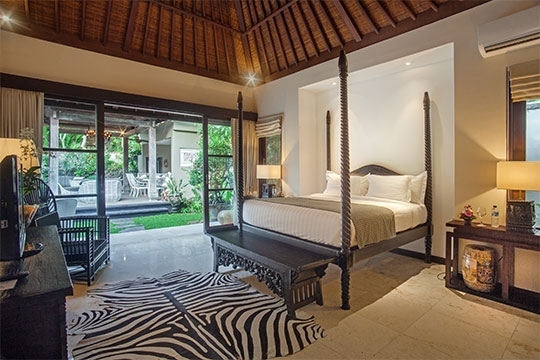 At any of the three Avalon Bali villas – four-bedroom Avalon I, two-bedroom Avalon II and one-bedroom Avalon III – days slip pleasantly by, full of blissful beachside leisure. 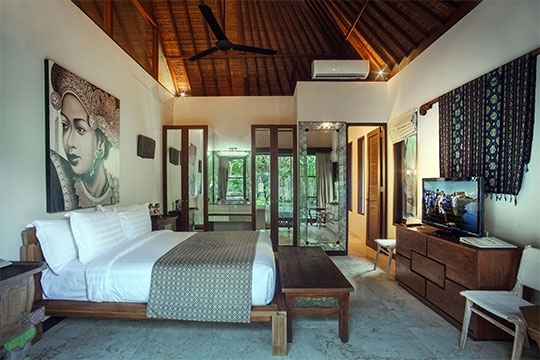 Every two-bedroom villa should be just like this, with an outdoor living room by the swimming pool. The villa was completely safe and kid-friendly. Staying at a private estate gave us total peace of mind as parents of school-aged kids. We had a comfortable amount of space and could always keep an eye on them in the pool, even from our bedroom or the living room. Staff handled everything, so we had so much quality family time in and out of the villa, and actually relaxed on this holiday! This holiday taught us all how to embrace what we now call rainforest living, and I finally understand what it means to enjoy “barefoot luxury.” One of the most fun and memorable parts of this trip was the rainy day, when we had to drop the bamboo blinds around our living area. We were surprisingly content to play cards as a family and notice geckos coming into our sanctuary and frogs leaping about the grass. Then we all retreated to watch TV in the bedrooms, but on the way there my indoor-type kids literally danced in the rain with pure joy. What a wonderful relaxing space we have round here in Bali. Staff have been so helpful in making restaurant reservation, ordering taxis for us. We will definitely be back to this luxury hideaway. Many thanks for your warmth and hospitality. Lovely accommodation, ever helpful and friendly staff - always at our service. Thoroughly enjoyed our stay. We stayed in Avalon II for two glorious nights in celebration of our 20th wedding anniversary. Our flight brought us to the villa very late, 3am. Where we were greeted with clean towels and a refreshing drink! This was the lovely of service throughout our stay. The villa was relaxing and dreamy. We would not hesitate to stay here again. We have had a wonderful stay and the service provided by the staff has been fantastic. The villa is a beautiful place and provided the perfect venue for our family to celebrate our wedding. We look forward to visiting again. Many thanks for looking after us so well. We have loved our stay here. 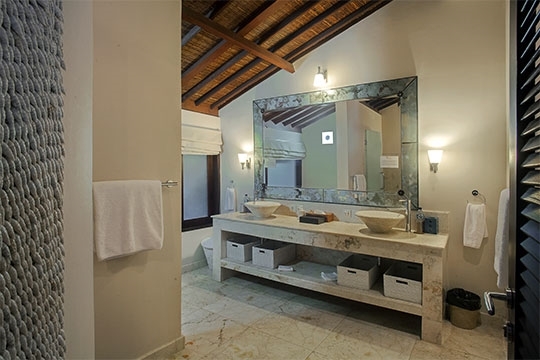 The villa and garden are very peaceful and staff very helpful and attentive. Its been a great way for our family to chill out. Really good to be here. Thanks a lot for everything and happy to be here again. Thank you so much for all you have been done for us over the last week. You guys are awesome!! Thank you Andy, Dina, Putu and the rest of the team for such a warm welcome and for looking after us so well in this beautiful oasis of peace and tranquility. Thank you so much to Pak Andy and the staff for a wonderful stay at the Villa Avalon II. We had a beautiful peaceful stay and are looking forward to coming back. A Very Big Thank You to Pak Andy & the wonderful team at Avalon. Having visited Bali many times over the years, this has been our best visit by far. Thank you for looking after us! Andy, Dina and the rest of the Avalon team you are amazing. Thank you so much for making our stay relaxing, carefree and unforgettable. Keep doing what you're doing!! To Andy, Dina, Putu & All the staff at Avalon Villa. Thank you for making our holiday such a wonderful experience. It was a joy to see your smiling face each day. Nothing was too much trouble. We will definitely recommend the villa to all our friends in Australia & hope to be back soon. Villa Avalon, so impressed!! Your hospitality was faultless and so welcoming. Thank you for a really amazing experience. Dear Avalon team, We came here to celebrate Virginia's birthday and it has been special from the moment we arrived. We have loved the villa, its space, pool & gorgeous staff & team. Thank you we have loved it, will recommend it & hope to come back. To Andy & the team. Thank you for your amazing hospitality, amazing food, amazing staff. We have all thoroughly enjoyed our stay. You'll always be in our thoughts & prayers. Perfectly sized for a small family or two couples, Avalon II has a winning combination of traditionally tropical outdoor space and luxurious modern bedroom suites. 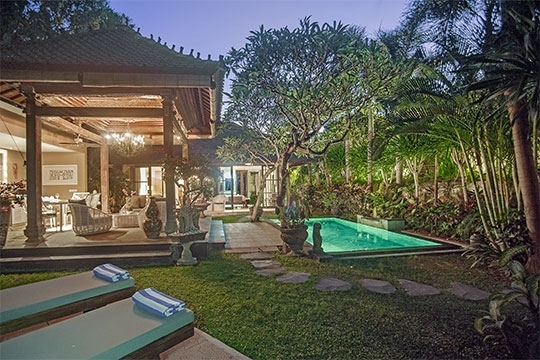 This two-bedroom Canggu villa is set within a private walled garden with a seven-metre swimming pool and sunbathing deck. 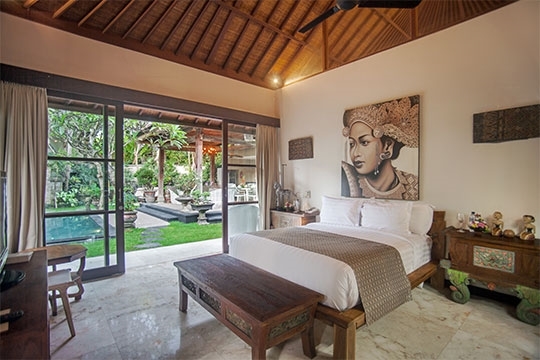 Amidst bonsais, frangipanis and heritage Indonesian décor, blissful relaxation happens naturally. 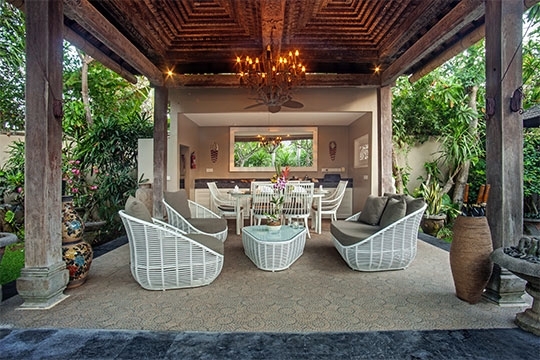 The Javanese teakwood joglo with an antique chandelier and ceiling fan doubles as an alfresco living and dining area with seating for six and, at the back, a well-equipped kitchenette (a helpful team of staff is on hand for meal preparation in the estate’s service kitchen whenever desired). Smooth stepping-stones across the lawn lead to a separate pavilion containing the two bedroom suites. 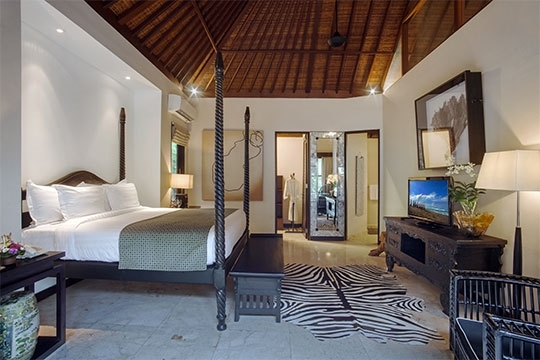 The bedrooms at Avalon II – one king bedded and one queen-bedded – are modern, air-conditioned havens with hand-carved dark wood furnishings, gorgeous white bedding and Javanese and Balinese decorations. Each bed has a wooden bench at the foot and view to a flat-screen TV with DVD player. Vaulted ceilings and mirrors maximise the space beautifully. 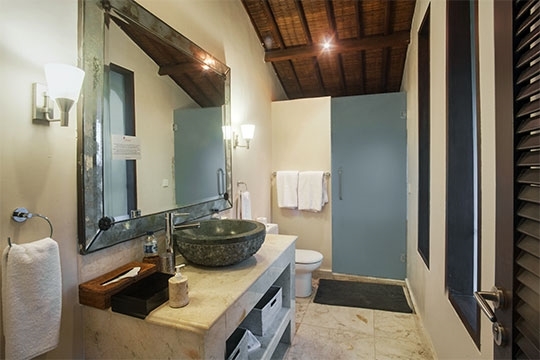 The connecting bathrooms are as large as the suites, and just as luxurious too – think marble surfaces, rain showers and baskets of plush white towels. The cherry on top are exotic orchids atop tables and frangipani flowers, in white and sunset hues, placed on bedside tables and hand towels. A totally indulgent tropical sanctuary awaits. 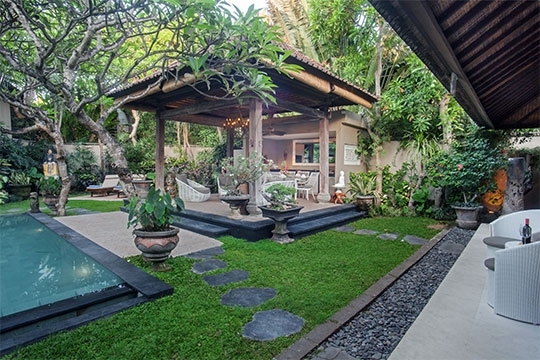 2 bedroom villa located in Canggu, Bali. Ideal for Beach in ten, Body and soul, Bring the relatives, Kid friendly, Fair share for groups, Sensible for seniors, Perfect for weddings. 8 out of 10 based on 17 user reviews.